Introduction: The book, All We’re Meant to Be by Letha Dawson Scanzoni and Nancy A. Hardesty, published by Word Books in 1974, is considered to have been a major factor in launching the biblical feminist movement in the 1970s. This post and the next several posts here on my Letha’s Calling blog will tell the story of how the book came to be written. It was written during a time when few Christians, particularly those in evangelical circles, dared to raise questions about the traditional roles of women in home, church, and society. The matter was considered settled, and to challenge the male-female hierarchy as being divinely ordained was considered extremely controversial if not heretical. In the concluding section of my April 14, 2010 post here, where I told the back story of my 1968 Eternity magazine article on equal-partner marriage, I quoted from a May 13, 1968 letter I received from an assistant editor at the magazine, fairly new on the job at the time. (In my blog post telling about the editorial staff’s concerns over the “Elevate Marriage to Partnership” article, the assistant editor’s letter to me appears near the end under the heading, “I Thought That Would Be the End of it.”). 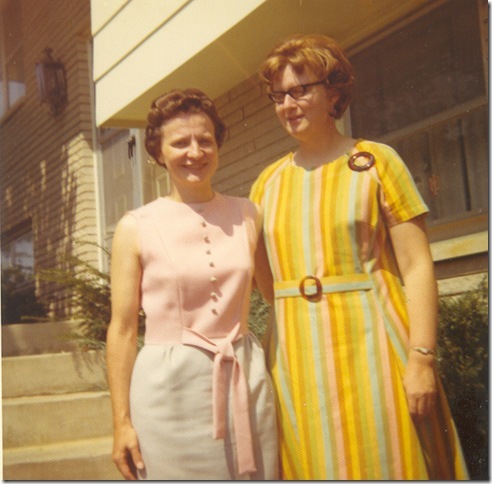 Nancy and others on the Eternity staff knew from correspondence and the articles I had written during the 1960s that I was planning to write a book challenging traditional gender constructs as they affected women and men in the home, the church, and society in general. Several Eternity editors, including Nancy Hardesty, would occasionally send a brief note with book titles or articles they thought might be useful in my research on the various topics they knew I was writing about. By the time the 1968 Eternity article on equal-partner marriage had been published, I had already written two books (published by Revell), and a third book was in press, written at the request of Zondervan Publishing House after editors there saw an article John and I had coauthored for Eternity magazine on Christians and sexuality. I was also writing articles for other Christian periodicals and curriculum materials for a Sunday school publisher, accepting some speaking engagements, teaching Sunday school at our local church, and working with a college discussion group meeting in our home. I was at the same time busy with everyday household tasks and child care and was also thinking about completing my education, which (as was true of many women in the 1950s) had been interrupted by marriage and children. So although the“women’s liberation” book was not forgotten. it was temporarily put aside and only being worked on sporadically. But all the while, an idea was gestating in my mind. In October of 1969 the idea travelled from my mind to typewriter and letterhead. I decided to write to Nancy Hardesty at Eternity Magazine. My letter is dated October 7, 1969. An idea has been kicking around in my mind for some time. I’ve prayed and thought about it a great deal and have decided the time has come to ask you what you think of it—so I’ll come right to the point. Would you be willing to consider the possibility of joining me as co-author of the book on women (i.e., woman’s “place” in the home, society, and church)? I know you’re very busy and perhaps would find it impossible to give time to such a project. Or perhaps you’d simply not be interested. Yet, I decided I couldn’t lose anything by asking! 1. Your obvious interest in the subject. I’ve really appreciated your sending the various articles for my research file. These, along with comments in letters you’ve written, lead me to believe you and I have similar views on the subject. 2. I feel the book could be much more helpful to readers if it could include the viewpoint of a single woman as well as that of one who’s married. (I’m assuming you’re still single.) What made me think of this angle was a conversation I had not long ago with a missionary friend—a single woman in her mid-thirties—who has been puzzling over this matter of expressing sexuality as a single person. I shared with her the letter you wrote last year in which you recommended the book by the Ryans, Love and Sexuality, which deals with this matter. Since then, I’ve read the book and can see why you were so impressed. It covers areas of life that are seldom thought through or discussed by Christians, and it shows that there is a way for an unmarried Christian to live as a whole, total, free human being, and that one doesn’t need to be pressed into either the “repression” mold of much traditional religious teaching or, on the other hand, the Helen Gurley Brown “Cosmopolitan” pattern for the single girl. 3. I feel we might be able to complement one another by bringing both a psychological and a sociological approach to the subject matter, yet both within a Biblical framework. I may be wrong about this, but I have the feeling you may see things a bit more from the psychology angle, whereas I tend to look at the woman situation (and other things) more from the standpoint of sociology (this has come about by some sort of “osmosis” I think from living with John [a sociology professor at Indiana University in Bloomington]). 4. The “loneliness” of the project. This reason might sound strange, but what I mean is that I feel a need to toss around ideas with another Christian woman of similar outlook who has done a great deal of thinking along these lines—as you have. For some reason, this issue seems extremely volatile in the minds of many Christians. Emotions are quickly aroused when it’s mentioned. The men and women who have the strongest opinions and seem most eager to express them are those which have rigid traditional ideas which really restrict women—and they’re quick to cite Scripture to back them up. One occasionally meets women who are questioning these ideas and are willing to discuss the subject seriously. But seldom have they really thought through some answers or read much on the matter. Many women in Christian circles would be afraid to voice their disagreements with traditional views, and many others seem perfectly content with things as they are. This is changing, however, among younger evangelicals—particularly on college campuses; and I feel the projected book could be of real help to many of these (both men and women). I guess that about sums up the matter. I’d really like to welcome you aboard the project if you feel it would be of interest to you. If not, I’ll certainly understand. Again, let me thank you for all the interest, suggestions, and encouragement you’ve provided thus far. I’ll be looking forward to hearing from you. I have reproduced the letter exactly as I wrote it in 1969, resisting the temptation to edit it. I placed it in an envelope addressed to Nancy Hardesty at Eternity magazine, licked a 6-cents stamp (no self-sealing stamps in those days), put the stamped envelope in a mailbox — and waited. But do you want to work with an “old maid school teacher”? Since last you heard from me, I have taken a job here at Trinity College [now Trinity International University in Deerfield, Illinois]. I should really say two jobs: directing the News Bureau and teaching four writing courses. I can’t say I want it to be my life’s work but I rather disliked the East, wanted to move back to the Midwest and wanted to make a bundle of money. So I’m here. I’m over my head in work, having never taught before, but your idea interests me because maybe it would give me one thing to do that I liked. I’m sure I would enjoy bouncing ideas back and forth. I do have a real hesitancy though about what I could contribute. I have no real answers — perhaps I could find some. I don’t know if I’m doing a very good job coping with the problem myself. Having just gone through a move, I get bitter about coming home at night and having no one’s shoulder to cry on, no one to sympathize about how hard it is; no one to help in all the decisions about buying cars, renting apartments, moving furniture; no one to shoulder any of these extras of living like shopping, servicing the car, doing the laundry. Married men around here complain about how hard their move has been—but they had a wife at home to unpack, greet them with a kiss and a hot meal, to make sure there was clean underwear in the drawer every morning. A single person has to carry both loads—and with very little help or understanding. I don’t know whether I approach this psychologically or just introspectively, but I don’t do it sociologically, I don’t think. I am very interested in it theologically. I try to be biblical, though I dislike putting it that way. I try to be Christian, as I interpret that, but sometimes it’s so hard. Yesterday in my creative writing class one of the girls had a line in her poem, about how God’s love is sufficient when a love relationship with a guy has fallen apart. I challenged her on it: does she and the others really believe that. Most of them began to say they were sure of it, one finally answered more truthfully, “I hope so.” I still hope so, but on a day to day basis, I can’t say it is. There’s also the myth—at least that’s what I hope it is although most people believe it is the “true” Christian position on human personhood—that one is most truly human in a marriage relationship. I’m sure that the girls in my classes have bought this entirely. But if you buy this and then don’t get married, you have a very difficult time justifying your own continued existence. But there are so many things. Perhaps I’m just looking for a way to try to find some answers for myself. How helpful they would be for others, I’m not sure. So if you still would like to work together, I would like to try it. Perhaps since I’m now living closer it would be easier to work together. My home address is. . .
And so we were on our way. It was clear neither of us expected to provide easy answers. We both had too many questions ourselves. But we hoped that by searching for our own answers, we could help other women as well—women who no doubt had the same questions and needs for encouragement and support that we did. In upcoming posts in this series, I’ll tell about my reply to Nancy’s letter and how the process of writing the book got underway and progressed, how it deepened our friendship, and how it introduced us to an expanding community of women and some supportive men who likewise yearned to combine their Christian faith and their feminism. In the next post, I’ll reproduce the original two-part preface of the book as it was published in 1974. It summarizes much of the detailed account above, and it also tells what writing the book meant to us and how it affected us personally. Letha (left) and Nancy (right) are shown here after attending church services during one of Nancy’s earliest visits to Letha’s home in Bloomington, Indiana, circa 1971.